Should Syria's smuggled antiquities be repatriated before the conflict ends? International condemnations from citizens and governments have reached near fever intensity as most of us are horrified and disgusted at what jihadi militants are smashing and decimating in Syria. And also in places like Mosel and Nimrud in Iraq and increasingly in Africa and Asia from Somalia to Timbuktu in Mali on to Pakistan and beyond. Officials and citizens in Syria continue organizing grass roots heritage campaigns and workshops to save our shared global heritage which has been in their protective custody for thousands of years. But never has our heritage faced more ravaging and serious threats than today and an intense international debate is happening on the subject of how best to preserve artifacts from the ancient world in the midst of war and religious extremism. Subjects being examined include whether international collectors and museums-and even international institutions and police agencies should stop returning or repatriating suspected stolen artifacts to the lands from where they originated, including thousands from Syria. Some Museum directors, archaeologists, collectors argue in favor of the proposition that favors retention or "partage" of endangered artifacts unlawfully removed from source countries. In this context "partage" means sharing of a country's antiquities which was the colonialist- even orientalist- system put in place mostly in Egypt, Iraq, Turkey and Afghanistan to divide up ownership of excavated artifacts during the beginning of the 20th Century. The advocates of partage usually are quick to point out that developed countries would hold the treasures of countries at risk for safe keeping but not in perpetuity. But at least keep them in lockup until a conflict is over and security for the irreplaceable heritage objects can be substantially assured. According to the New York Times this week, given the violence in Iraq, Syria, Afghanistan and northern Africa, the former director of the Walters Art Museum in Baltimore, is advocating that museums become much more circumspect about rushing to return antiquities. His reasoning is based on a claimed fear for the safety of the antiquities once they arrive back in the source country. This observer has to date detected no widespread support for this argument in Syria which if adopted could seriously delay repatriation of Syria's looted and smuggled antiquities. Syrian officials and scholars interviewed me overwhelming reject this point of view as does the Syrian public. Some have noted that using the destructive frenzy by Islamic State extremists to lobby against repatriation seeks to justify discredited practices and reeks of neo-colonialism. In point of fact, support for repatriation-immediate return has gained ground in antiquities circles in recent years and this is the position of antiquities officials in Syria. The above noted argument is also opposed UN Specialized Agencies including the United Nations Educational, Scientific and Cultural Organization (UNESCO) which strongly opposes museums and collectors acquiring ancient objects if the items left their countries of origin after 1970. The widely shared UNESCO policy is focused on impeding archaeological smuggling by curtailing demand while upholding the sovereignty of source nations. Repatriation is also enshrined in international treaties, international customary law and the laws of many nations including the European Union countries and the United States and Canada. The current trend is that museums and art dealers are agreeing to send back or repatriate vaguely documented or disputed artifacts to Syria, items often obtained under dubious circumstances. Ricardo L. Elia, an archaeologist at Boston University who believes the Western market for antiquities spurs the plundering of global archaeological sites was quoted this week in the NY Times as declaring "It was only a matter of time before some in the art-collecting community tried to turn this cultural nightmare to their own advantage by advocating retaining antiquities looted elsewhere." But some antiquities experts say pillaging by jihadists and radical groups in Syria challenges UNESCO orthodoxy because irreplaceable antiquities ought to be considered the common property of all mankind and that wholesale repatriation endangers the cultural heritage of the very countries it supposedly benefits. This argument claims that the sources country may not be able to protect and preserve its antiquities particularly during periods of violent conflict like those raging in Syria and Iraq. A former vice chairman of the American Bar Association's Art and Cultural Heritage Law Committee, Mr. Peter Tompa stated this week, "If the people of these lands are indifferent and even hostile to their 'cultural heritage,' what's the point in reserving it for them to ignore or destroy?" But this argument has to date been largely rejected. The Association of Art Museum Directors, which circulates guidelines for some 250 museums in the US, urges its members to cooperate fully when their antiquities holdings are challenged and the association supports immediate repatriation of Syrian looted and smuggled antiquities. This practice is preferable so as not to weaken or obscure the right of Syria to possess and protect its stolen antiquities and increasingly, according to UNESCO, the Syrian Ministry of Culture and its Directorate General of Antiquities and Museums are very capable of safeguarding and preparing for their exhibition and the return of tourists once the crises is over. 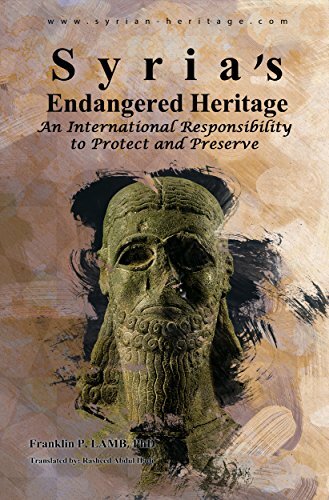 Franklin Lamb's most recent book, Syria's Endangered Heritage, An international Responsibility to Protect and Preserve is in production by Orontes River Publishing, Hama, Syrian Arab Republic.